Users within a limited geographic area can form service-sharing communities using the services deployed on their mobile devices. Creating Quality of Service (QoS) optimal service compositions in such decentralised and dynamic environments is challenging because of the service providers’ mobility and the inherent dynamism in the available services. Existing proposals for mobile environments either use template-matching composition or require a-priori knowledge about the QoS objectives’ weights, which limits the composition’s flexibility in such environments. 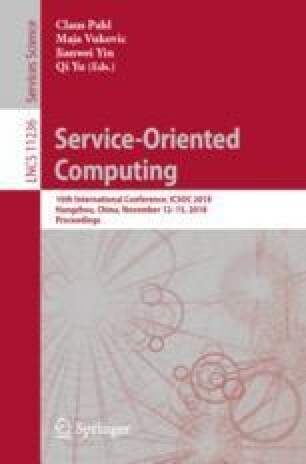 This paper presents a stigmergic-based approach to model the decentralised, flexible and dynamic service interactions of providers in a mobile environment. A nature-inspired optimisation mechanism is used to approximate the set of QoS optimal compositions that result from these interactions. To facilitate adaptation of the composite during execution, we introduce a procedure that encourages the exploration of service composition configurations that emerge as a result of providers’ mobility. We evaluate the performance of the proposed approach with a no-adaptation variant, a Dijkstra-based, a Greedy and a Random approach. The results show that the proposed approach can obtain superior solutions compared with current optimisation methods for flexible service composition in mobile environments at the cost of increased overhead. This work was funded by Science Foundation Ireland (SFI) under grant 13/IA/1885.